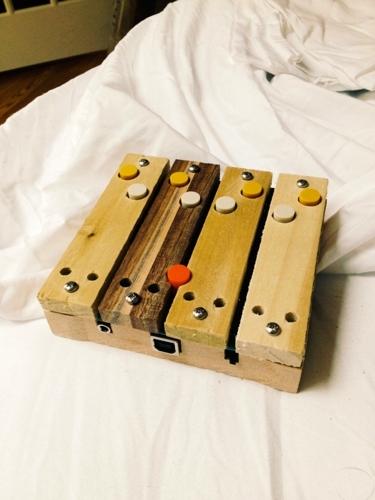 I've been working with Peter Blasser's (Ciat-Lonbarde) new instrument, the Shnth, for the past few months and plan to share some patches here soon. "The Shnth, by Shbobo, is a computer music device that features the ARM Cortex M3 32 bit processor. It connects to host computer via USB, wherein the host computer (windows, linux, or macintosh) may read its "squish data" and create graphics and sound. Or, the Shnth itself is a standalone synthesizer, which may be programmed by host in the new language, "Shlisp", by Shbobo. It is potentially self powered, by batteries, which are charged, again, via USB. A switch turns it on, and 16 bit sound comes out a standard stereo 3.5mm jack. Like a laptop; it is "handtop". Four bars on top feel your fingers and two woven antennae below sense flesh, complimented by a battery of buttons. There are red lights."